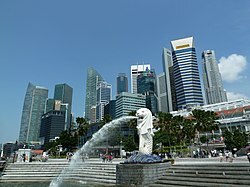 Tha Singeapòr neo Singapore (Beurla: Republic of Singapore, Malayis: Republik Singapura; Sìonais: 新加坡共和国, Pinyin: Xīnjiāpō Gònghéguó; Tamilis: சிங்கப்பூர் குடியரசு, (Ciŋkappūr Kudiyarasu)) na dùthaich is na eilean neo-eisimeileach ri taobh Malaidhsia. B' àbhaist dha a bhith na cholonaidh Breatannach, ach a-nis, 's e tè de na dùthchannan as beartaiche ann an Àisia. 'S e Beurla na prìomh-chànan aice, ach tha Sionais cumanta cuideachd. Air a tharraing à "https://gd.wikipedia.org/w/index.php?title=Singeapòr&oldid=520031"
Chaidh an duilleag seo a dheasachadh 26 dhen Iuchar 2016 aig 05:05 turas mu dheireadh.